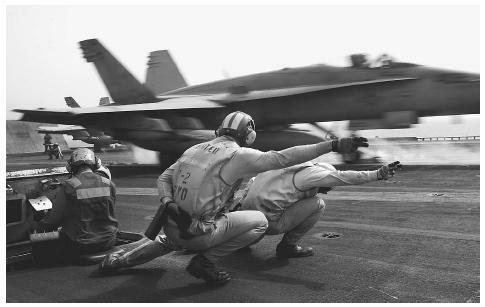 A flight deck crew gives the launch signal as an F/A-18-C Hornet is catapulted off the flight deck of the carrier USS Kitty Hawk in the Persian Gulf as part of over 3,000 American sorties flown during Operation Iraqi Freedom. Haze Gray and Underway World Aircraft Carrier Lists. < http://www.hazegray.org/navhist/carriers/ > (April 13,2003). U.S. Navy—The Aircraft Carriers. U.S. Navy Office of Information. < http://www.chinfo.navy.mil/navpalib/ships/carriers/ > (April 13, 2003).